This year we are bound for the USA and the Dominican Republic for the first time in both cases. This is our big trip for 2017 and of course with every new big international adventure, there is always a couple of new gadgets and accessories that come along for the ride. Travelling with kids of course adds extra challenges with the things you need to take and the needs to consider, but also as adults we have our own new toys to try out sometimes. We have a few new ones of each to share with you in this round up. 1.0.5.1 What is the latest gadget or travel accessory you have purchased? Comfort is everything when you travel with kids. Comfortable kids are happy kids and happy kids mean happy parents… it’s a win all round! So when we were given the opportunity try out the super cool Plane Pal for our upcoming trip, I was pretty excited! Our last international trip with two kids was all sorts of hell on the way to Europe, with our youngest in my arms and the eldest still a bit too young to settle comfortably on her own… and struggling with a head cold. It was a long, horrible night. The rest of our flights were not as bad, but comfort was minimal. Plane Pal is essentially an inflatable travel pillow that fills the gap between the seat and the seat in front and creates a mini bed for kids on the plane. From what we have seen online, they inflate within seconds and deflate quickly too. Easy to use but best of all, the kids will have a comfortable place to sleep on the long haul flights, and we will have a better chance of getting some rest ourselves. Less exhausted people means happier start middle and end of holiday! Check out the Plane Pal website to learn more and stay tuned for our review in a couple of months. As a work at home mum, sometimes when we aren’t travelling and are just in the normal day to day routine, I spend a lot of time at the computer working and trust me, my step count is not so great some of those days. Having a steps tracker keeps me motivated to keep my step count up even when I’m at home. Would you believe the bad luck that my old tracker malfunctioned about 4 days before our last trip to Europe. When you get a little obsessed with outdoing your own personal best… it was pretty depressing not to have one while walking non stop around the stair filled city of Dubrovnik haha but when I got home I got myself a FitBit Charge HR and it has been great. The one negative is its not waterproof so I need to take it off for swimming, but it is great to double as a watch and step tracker in one, plus the silent alarm function is fantastic for travel when you’re on the road and don’t want to wake the kids but need to get up. It just vibrates lightly on your arm to wake you. Works everytime but I’m a mum so I’m a light sleeper! Memory keeping is always such an important part of our lives, whether we are home or travelling and we have the photo side of things covered and the occasional video on our phones too, these days deciding to leave the bigger chunky video camera at home. But when there’s water involved, the camera or phone were not much use to use in capturing those memories. 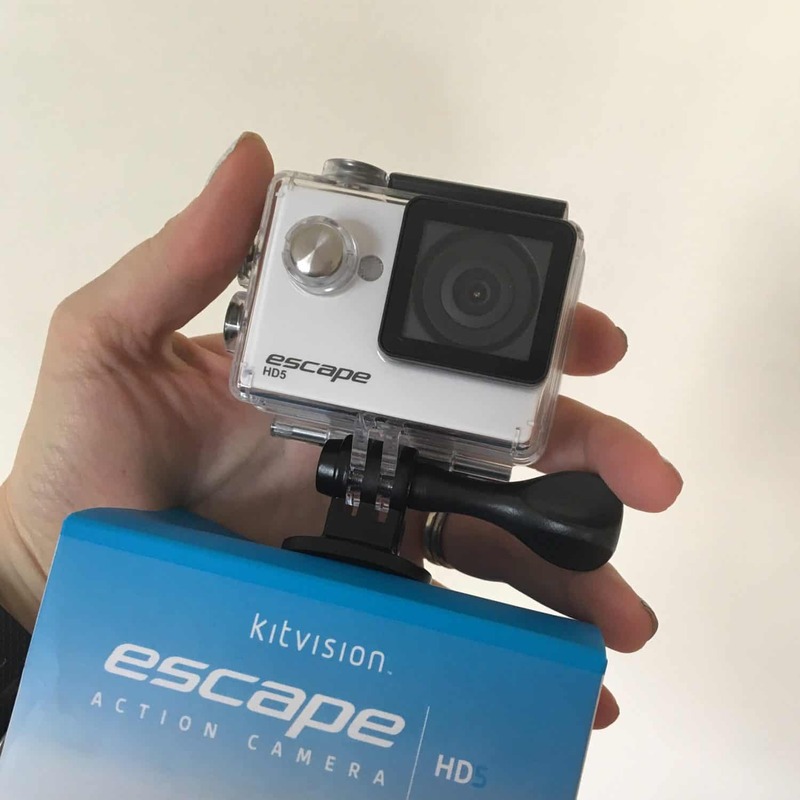 All that chances now with the kitvision Escape HD5 Action Video Camera! This adorable little action cam is a budget friendly option for having video no matter where we are… even under water. Completely waterproof in the included little water proof casing and easy to use, it gives us the chance to photograph memories when we are swimming, at the beach, in the rain or wherever we may be otherwise too scared to use our usual memory keeping gadgets! It’s not blockbuster movie quality but it’s a fun way to record videos with the 5MP camera capacity. We recently tested it out on the water slides at a water park… the ultimate action fun!! You can check out the action camera here. We are headed to the Tripadvisor voted number 14th best beach in the world in April – Bavaro Beach, Punta Cana… plus other awesome places around California on either side of our Dominican Republic stay. That gives us some great opportunities for some time lapse video fun using this compact rotating camera mount. It’s small, easy to use and is sure to create some cool video scenes while we enjoy our spring break holiday! Check out the details here. I have a tiny car so small prams and strollers were always as important as those essential accessories to help support a vehicle. But even more so is the fact that we travel often and now have 2 small children… a toddler and a 4 year old and sometimes they both need to rest their legs. That meant finding a pram that suited our travel needs and the Mountain Buggy Nano Stroller is perfect! It even doubles as a naptime spot for our big girl when all the travel walking gets too much! It folds down so small that we can take it on board as carry on, folding down to a small square, with a carry bag and shoulder strap. Incredible… and so easy to put up and fold down too. Ours has been to Europe and back and is set to accompany us to our next overseas adventure too. Check out the specifications and find where you can get your own Nano. What is the latest gadget or travel accessory you have purchased? Great tips. Thanks for sharing and keep up the great work.